In Kuroshio Town the average annual temperature is 17 degrees and the annual rainfall is around 2,800mm. It is blessed with a temperate climate and abundant nature, with a beautiful sandy beach spreading along the coastline and all around are deep green mountains. Additionally, there is plenty of fresh seafood, such as katsuo, and many goods to be had in the mountains. Southwestern Tosa has a large sports zone in the town, with various exercise facilities such as natural and artificial turf soccer fields, baseball fields, athletics fields, tennis courts, a gymnasium, and a park golf course, etc. All are within a walking distance of 5 minutes. It’s a wonderful sports environment and provides a place for athletes of various generations to gather and deepen their exchanges. In addition, Kuroshio Town boasts a 4 km beach, Irino Beach, where you can also incorporate “sandy beach training.” You’ll be surprised at the benefits of running on sand. Sunabi Sports serves as the point of contact for the NPO Sandy Beach Art Museum, where we arrange sports facilities and lodging, as well as training camps and conference planning, management, etc. 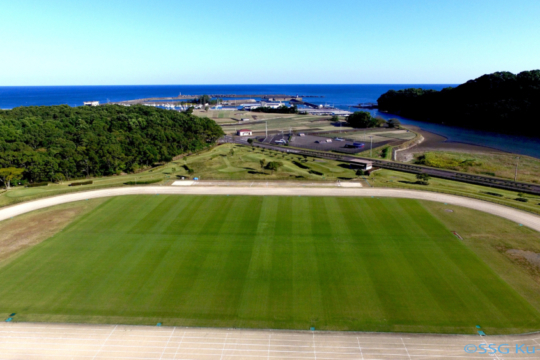 We support many kinds of activities to help you enjoy sports in Kuroshio Town. Also in our town, to support sports projects, we have prepared a subsidy system for amateur sports camps. Supporting sports is very important in us.